Should you always practice for your dosha? 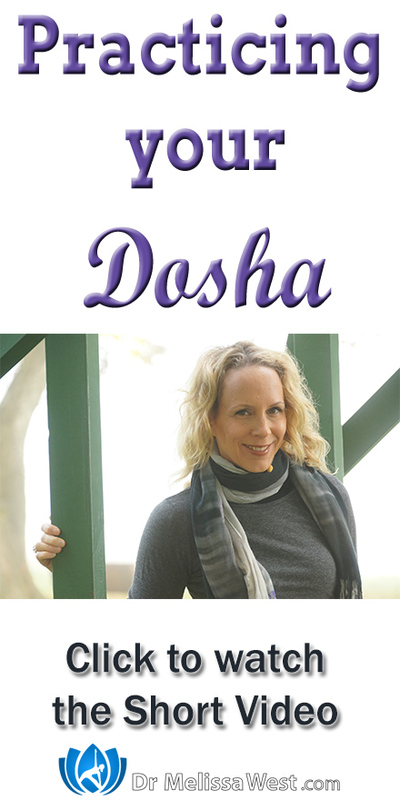 Hi Melissa,I just watched namaste yoga episode 45 about the different doshas and was wondering if you always should do yoga according to your dosha, or is it enough to do it sometimes? My favorite yoga type is hatha yoga but I guess hatha isn´t for any specific dosha type. Thank you for a great question Sara. The short answer to that question is yes, you should always practice yoga with your dosha in mind. Also here is a quiz to determine your dosha, so you know which doshas is predominant in your mind, body and spirit when you come to your yoga mat. In general vatas should keep their energy grounded, even, consistent. Their practice should be moderate and they should aim to sustain their enthusiasm. Vatas can allow their bodies to be calm, centered and relaxed. They should experience asana slowly and gently without any undue or sudden use of force, avoiding abrupt movements or use of strong muscles. Vatas ought to keep their breath deep, calm and strong, focusing on their inhalation. Finally, vatas should aim to keep their mind calm, concentrated and grounded in the present moment. Pittas are advised to keep their energy cool, open and receptive like the newly waxing moon. Pittas do well to keep their bodies cool and relaxed and focus on surrendering their bodies during asana to remove heat and tension. When breathing, pittas should allow their breath to be cool, relaxed and diffused and exhale to relieve heat as needed. Finally, mental focus should be receptive, detached and aware, careful to release any sharp and critical focus. Finally kaphas need to make sure they warm up and do their asanas with effort, speed and determination. Kaphas definitely benefit from an active ashtanga, vinyasa style practice. They need to keep their bodies light, moving, warm and dry. They are encouraged to take deep, rapid breaths to encourage prana vayu, the upward moving energy. Namaste Yoga 93 and Namaste Yoga 240 Finally, mentally kaphas should keep their minds enthusiastic, wakeful and focused like a flame. Resource: Yoga for Your Type: An Ayurvedic Approach to Your Asana Practice by Dr. David Frawley and Sandra Summerfield Kozak M.S.